Free U.S. Priority Shipping! Turn your smart phone, tablet, or PC into a sophisticated diagnostic scan tool, trip computer, and real-time performance monitor. 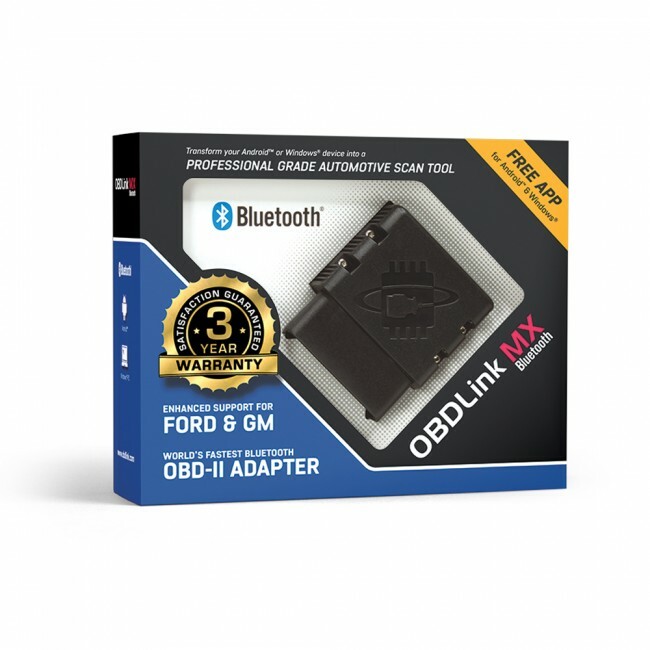 OBDLink® MX Bluetooth can access GM SW-CAN & Ford MS-CAN networks in addition to standard OBD-II protocols. OBDLink® MX is a budget-priced, pocket-size Bluetooth OBD-II adapter for all OBD-II compliant vehicles (except hybrid or electric vehicles). It can be used as a diagnostic scan tool, trip computer, logger, and real-time performance monitor. OBDLink® MX surpassed performance in every competing Bluetooth OBD-II adapter, delivering 300% more data samples per second. Its BatterySaver™ sleep mode allows the adapter to stay plugged in continually, without draining the vehicle’s battery. Unlike the vast majority of Bluetooth OBD adapters, which constantly broadcast their presence and use an easy-to-guess 4-digit PIN, OBDLink® MX utilizes a unique multi-layered link security mechanism, eliminating the risk of unauthorized access. OBDLink MX’s support of the de facto standard ELM327 command set, makes it compatible with tons of third-party OBD software and mobile apps. 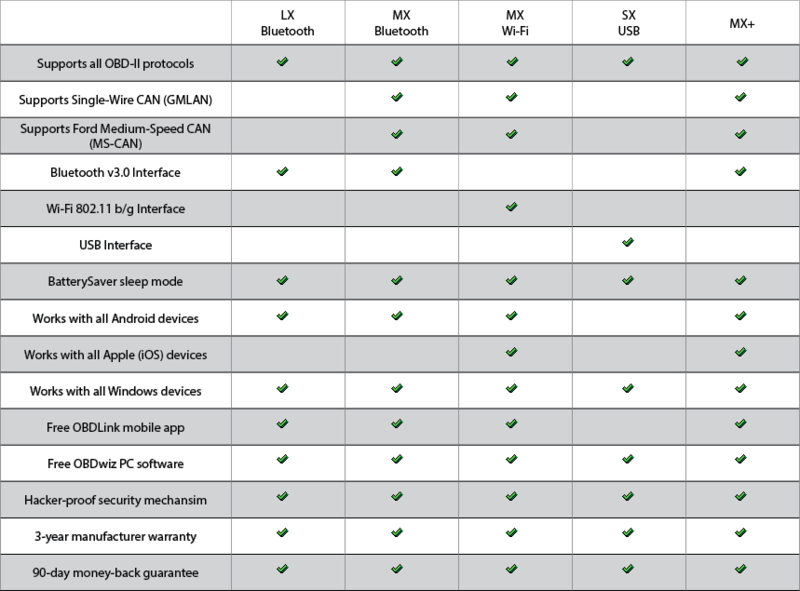 OBDLink® MX comes with an unconditional 90-day money-back guarantee, and a 3 year warranty. Technical support is offered through our Community Forum which is monitored by ScanTool.net Team Engineers: OBDLink® MX board. Bought this for my 2012 Buick Regal GS. I wanted something to show boost and fuel pressure, IAT, and EGT. I use the app Torque on my Galaxy S7 to log and see real-time data. You can also get a plugin that will record real-time data over video recorded by your phone. If I get to go to Barber's or Road Atlanta for a track day, I hope to put it to good use. Communication speed is pretty good. I am thinking that the refresh rate of the data depends some on the device you are using it on. The rate on a older phone might not be as good. Have only had it a day but it is amazingly easy to setup. I returned a unit from BAFX that was less expensive and a PIA to even get connected. This was connected in under 2 minutes and working great with Tourque app and the OBDlink app. Communication is very quick, unit is much smaller as well. 5 Stars for now, will update later if I have any issues. I am just very happy that it works as advertised since I spent over 2 hours with that other POS just trying to get it to connect. I originally purchased an Elm327 bluetooth connector. Those are the translucent blue one's for cheap cheap cheap. Guess why? The Elm327 would not connect to my 1999 Regal or Saturn that run J1850 protocal. I bought the OBDLink LX and "Bam!" it was chatting away once it paired. It also didn't drain my car battery when left plugged in. The software included is on par or better than Torque. I like the initial gauge setup in the included software better on my double DIN headunit I'm running it from. I have been using this since Sept 2014 and was posting a link to it in another review so I thought I would leave a review of this product as well. The software is OK but I think a lot of people just use Torque Pro. It works perfectly with this app. I recently bought a Garmin Virb Ultra 30 and it easily paired up with the camera and lets me log various data points like Speed, RPM and Load and drop gauges right on the video while editing it. I couldn't find information on which OBD-2 dongles were compatible with the Garmin but this one works perfectly. There were a couple fields that were not collecting data (fuel consumption and torque) but the Torque app doesn't read these values on my 2015 Subaru WRX either so I don't think it is a limit of this device or the Garmin it is just that not everything is available with every vehicle. This dongle has worked great with all of our vehicles (09 Jetta, 11 Yukon, 15 WRX) but as expected the VCDS does a lot more with the VW. I have 4 adapters, 1 its small handheld, 3 are BT chinese, including the Elm327. With some cars I did not have any problem until I bought my Jeep. Non of my adapters work on my Jeep Grand Cherokee 1999. I was starting to think that the port or the ECU was damage, but I realice that non of my adapters was more expensive than 20U$ So I decided to bought a good one and give it a try. I Have torque (the android app) and from their wiki I found that one of the most recommended was this "ScanTool" So I went for it. First I tried an Autel direct connect: Very solid, lots of features, but the software froze up the second time I used it: bye! Then I got a Veepeak wifi scanner for Windows. It was a very tight fit (too tight), hard to connect, and then all I got with my expensive OBD Auto Doctor software was "Invalid OBD Standard"....bye. Then I bought this. First I tried it with OBD Auto Doctor and it paired and worked just fine. !!!! The I downloaded their OBD MX software from their site, ****SAVE THE LITTLE PIECE OF PAPER WITH THE LICENSE CODE*** that comes with the scanner. The scanner paired to my Windows 10 laptop fine, but the program itself would not connect via Bluetooth UNTIL I changed the COMMUNICATION TYPE setting to the first checkbox for USB,BluetoothRS-232 AND also changed to COM PORT 6, and then everything clicked right in. Frankly, the OBD WIZ app was as good as the expensive OBD Auto Doctor in my opinion, for everyday drivers. I am sure there are differences that mechanics would notice and so on, but I don't understand half the stuff they scan anyway. I have had no issues with the device and it has already been put to work in a handful of different vehicles. The communication speed between the device and phone is blazing fast. If you use an application like Torque Pro the device will read realtime data and display it with more accuracy than the actual gauges in real time. This device is only as good as the software that supports it. It does come with free software that works well, and other apps are available on the marketplace that may work better with your particular vehicle (Forscan is an example). The only reason I rated 4 stars instead of 5 is that you have to forget the device every time you disconnect from it. It gives a new code when you hit the bluetooth connection button so it won't 'remember' your phone. This is a minor inconvenience but it is still an inconvenience. Perhaps ScanTool can introduce a watch battery powered memory much like how your computer remembers Bios settings when it is turned off? I bought this with some reservations, as my wife's 2002 Subaru Forester doesn't function on some inexpensive OBD II readers. The readers don't see the car, and I don't know why some do and some don't. However this works perfect, I keep it in the car and use the software to play with the digital dash. I can read and clear codes, and leave it plugged into whatever I'm driving just to have it with me. Friends have borrowed it and it is awesome.